FREE public Wi-Fi coming to Bishop Auckland Town Centre! Businesses are you digitally ready to engage with your customers? 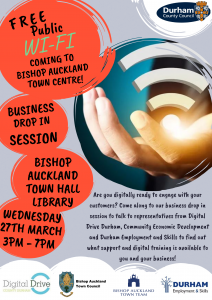 In preparation for the FREE public Wi-Fi in the town centre, there is a business drop in session where you can speak with representatives from Digital Drive Durham, Community Economic Development and Durham Employment and Skills. It’s an opportunity to find out what support and digital training is available to you and your business. The FREE public Wi-Fi in Bishop Auckland has been supported and funded by Durham County Council, Bishop Auckland Town Council and Bishop Auckland Town Team.